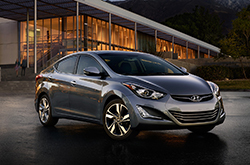 Continuing its legacy of capability and convenience, the 2016 Hyundai Elantra rides into a new model year with the classic style and extensive features that Elantra buyers have come to love. Adding an all-new Value Edition trim to the lineup, the 2016 Hyundai Elantra in Arlington is an incredibly well-rounded mid-size sedan fit for long commutes, family outings and casual tours around town. Continue reading our full 2016 Hyundai Elantra review below to learn more about this practical sedan that is bound to make your friends green with envy. Offering an astounding 28/38 city/highway mpg rating, your eco-friendly friends will surely applaud your choice when you flaunt this midsize sedan around town. But, this efficiency doesn't come at the cost of power. Outperforming the Toyota Corolla, Chevy Cruze and Honda Civic, the standard 2016 Elantra is equipped with an I-4 engine rated at 145 horsepower and 130 lb.-ft. of torque. Looking for extra agility? Our 2016 Hyundai Elantra review recommends the even more powerful Sport model which combines a 173-hp 2.0L engine and sport-tuned suspension for performance enthusiasts in the Dallas area. Test drive it once and we're sure you'll be hooked! 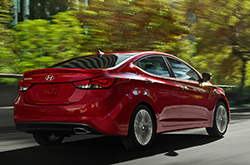 The largest addition to this year's Elantra comes in the form of an all-new Value Edition. A practical trim that settles right between the standard SE and the upscale Sport and Limited models, the Value Edition serves as an option for buyers seeking extra amenities without committing to the higher Limited price tag. Adding heated front seats, a Bluetooth hands-free system, a power sunroof and a 4.3-inch color touchscreen radio system, the Value trim builds on the already standard 6-speaker audio system, multifunction trip computer and satellite radio connectivity. Buyers of the Limited model will find the near-luxury sedan built for precision. Thanks to the Blue Link telematics system, driver selectable steering modes, leather seats and an available 7-inch navigation system, the top-of-the-line Limited provides premium features and upscale convenience at a price you'll love. If it is safety you are worried about, you can breathe easy knowing that the 2016 Elantra comes with advanced air bags, brake assist, LATCH child-seat anchors, traction control and a rearview camera that is standard on the Value, Sport and Limited trims. Comfortable, capable and alluring, the 2016 Hyundai Elantra in Arlington is the full package that local buyers are looking for. Stop by our dealership today and let us help you get back on the road in style. 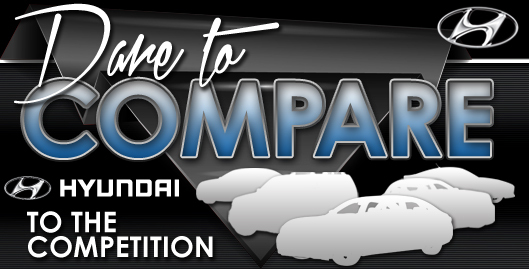 In a variety key areas, the 2016 Elantra beats out rivals like the 2016 Ford Focus, Honda Civic, Nissan Sentra, Mazda3, Chevrolet Cruze and the Toyota Corolla. You'll be pleased with the Elantra's long list of noteworthy characteristics, including its cut-rate cost and modern cabin features. For Arlington Hyundai customers who want a truly amazing value, just compare this vehicle's price to the opposition and you'll see that it's a good investment. View our Quick List under this paragraph to find out more! To make your car search less of a hassle, Vandergriff Hyunadi is happy to offer research tools like the 2016 Elantra review above, as well as reviews of older models. We take our duty to provide the best reviews drafted by automotive experts - it's just one more thing that makes us a prominent Hyundai dealership in Arlington. You can be confident of the information in this article to be precise and provide you with the details you need to [decide] if you want to lease the Elantra. Thank you for viewing Vandergriff Hyunadi's 2016 Elantra review. 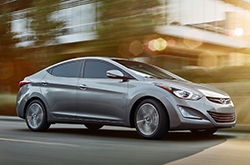 Now that you know more about the Elantra, fill out the form on the right to message us to learn about great lease offers and national incentives that can help you save significantly on your purchase.